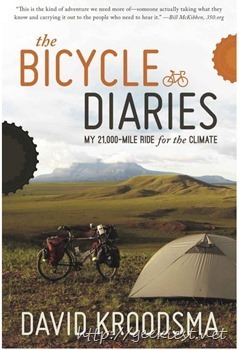 The Bicycle Diaries: My 21000-Mile Ride for the Climate is written by David Kroodsma, who is a climate researcher d environmental consultant. He traveled 21000 miles on his Bicycle to create awareness on the climate change. Below you can read just a small paragraph from the book. 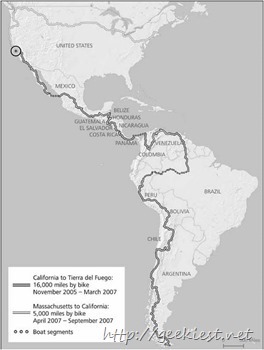 He traveled from California to the tip of the South America. you can see the route map below. It took almost 2 years for him to complete this. This book raised the fund for publication via kickstarter.com where 256 people helped him to raise $12722 to publish it.